It's easy to be cynical about professional sports -- especially the NFL. But despite the disturbing headlines the league earned this year, ranging from lax penalties for domestic violence to a growing awareness of the impact of traumatic brain injuries, there will always be at least one silver lining for professional football. That would be the undisputed, research-supported evidence that there are very real mental health advantages to claiming a sports team as your own. Yes, there are studies that show blood pressure rises during games or testosterone plummets after a loss. But epic fandom is also linked to higher levels of well-being and general happiness with one's social life, as well as lower levels of loneliness and alienation, according to research by sports psychology professor Daniel Wann of Murray State University. Wann, author of the book Sport Fans: The Psychology And Social Impact Of Spectators, explains that there are two routes to feeling good through sports fandom. "One would be following a successful team, and the second would simply be identifying with them," Wann told The Huffington Post. "You can get these well-being benefits even if your team doesn't do well; we've found this with historically unsuccessful teams as well," he added. In the end, said Wann, it all comes down to how community lifts our spirits. Sports fandom is simply another kind of community, much like the community fostered among costumed Star Wars fans or opera season tickets holders. "The simple fact is that people are looking for ways to identify with something, to feel a sense of belonging-ness with a group of like-minded individuals," said Wann. "People might not understand the sports side of things, but my response to that is: Think of, in your own life, what you care about and what you identify with. Sport is what these fans have chosen." Wann himself closely follows no less than four teams: two college men's basketball teams (the Murray State Racers and Kansas Jayhawks), as well as the Kansas City Royals and the Chicago Cubs. And he never misses a Racers home game. Still, there is one edge that sports has over all those other cultural communities, said Wann. "You have no idea who's going to win the Super Bowl, and you won't know who's going to win next year's Super Bowl," said Wann. "But if you go see the new Star Wars movie, and then you go to see it twice, I'm pretty sure it's going to be the same ending." So the next time anyone gives you flack about your epic fandom, just let them know that all the face paint, fantasy leagues, tailgating and game-day viewing parties are crucial to your mental health. Read on to learn more about the benefits of being a die-hard (or even fair-weather) fan. "We've known for years in psychology that feeling connections and affiliations with others is important for well-being," said Wann. "What fandom allows you to do is to gain those connections, which then in turn provides you with social and psychological health." For instance, doing something as simple as putting on a team baseball cap can have a powerful effect on one's sense of community, said Wann. Say, for instance, that you're wearing a Red Sox cap while walking through Boston. Several passersby will give you a thumbs up, high-five, fist bump or even stop to chat with you about your local team and its prospects. "All these people are going to be your friends and your comrades, even though you don't know their names, you've never seen them before, and you're probably never going to see them again," said Wann. "But you feel this important sense of connection to the world around you." 2. The community, in turn, boosts your sense of well-being. Of course, if you watch a game with others, your feelings of loneliness are going to be at least temporarily lower during the event. But Wann's research finds that simply knowing or feeling that you're part of a larger community has long-term positive effects. In fact, sports fans report lower levels of loneliness whether or not the game is on. "We've gone to people in classrooms. We've gone to dorm rooms. We still still find this general effect," said Wann. "They have this enduring level of connections to others, and lower levels of loneliness and alienation, whether or not they're watching the game." 3. Fandom gives us a common language. Being a fan of a sports team can also be a deeply rooted heritage that connects you to others across time, transcending the barriers that divide people generationally, adds Professor Alan Pringle, Ph.D. Pringle specializes in mental health nursing at the University of Nottingham and noted that soccer, the U.K.'s most popular sport, gives families a "common currency" that connects family members unlike few other subjects. "Most granddads were not that interested in the latest computer games, and most grandsons did not really want to hear what it used to be like to work in a coal mine," Pringle wrote in an email to HuffPost. "But the game offered often three generations of a family a shared experience, shared language and shared emotion that is not found in too many other areas of life." 4. Fandom is a safe space. Pringle also noted that in a culture where men often feel that they have to stifle emotional expressions, sports fandom offers some a safe space to feel, cry, laugh or show signs of affection. "The classic difficulties British men have with expressing emotion often means that they are limited in their opportunity to externalize emotion and often internalize it," wrote Pringle. "For many of them, football offers a safe space where expressed emotion is acceptable (even crying or hugging other men!)." In Pringle's research, he examines how following local soccer leagues gave some men a safe way to express identity, reduce their stress and feel a sense of continuity. He quotes one fan of a Mansfield Town soccer club, who said, "When I was a kid I used to go there, when I was married I went, when I was divorced I went, when I was married again I went, when I was divorced again I went, it's the only constant thing in my life." Finally, being a fan of a sport provides some with a rare experience: success. Feeling victorious, even vicariously, is a precious emotion in troubled times, psychology professor Ronald F. Levant of the University of Akron told CantonRep.com. 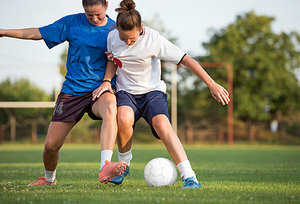 "Identifying with your sports teams is one of the ways you can vicariously experience success, and in real life, success is hard," Levant said in the 2010 article. "We have ups and downs, a lot of things don't always go our way ... especially in this economy." And for fans who love the sport enough to play it, that feeling of success is even more crucial. Pringle noted that in his town of Nottingham, hospital services are funding soccer leagues for young men with depression, schizophrenia or drug-related problems to play regularly scheduled matches. "The interesting thing is that it is one area of their lives where they can experience real success," Pringle wrote to HuffPost. "If you are going to be good at football you have usually developed real skill by around [age] 13 to 14, so lots of these guys struggle badly in many areas of their lives but can play really well, and for the time they are on that field they can engage in an activity [on] which their symptoms can, in many cases, have only a minimal impact."